I planted yesterdays trees tonight. It's coming along great Ralph. Well done. You definitely have made some great progress on the LV. The following was posted by akimmons whose real name is Arnold Kimmons in another thread. Since many may benefit from his work I have copied and pasted the information here. 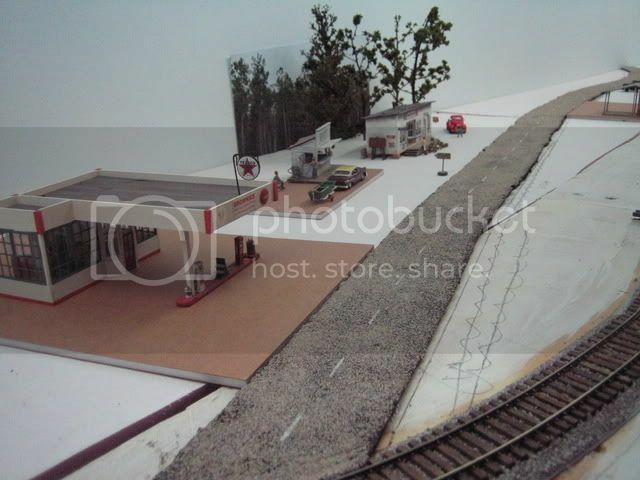 I recently finished a tar and gravel road on my layout and posted photos under my Royal and Edisto RR thread. Here's a short tutorial if you'd like to try it on your pike. First, a shot of the finished product. 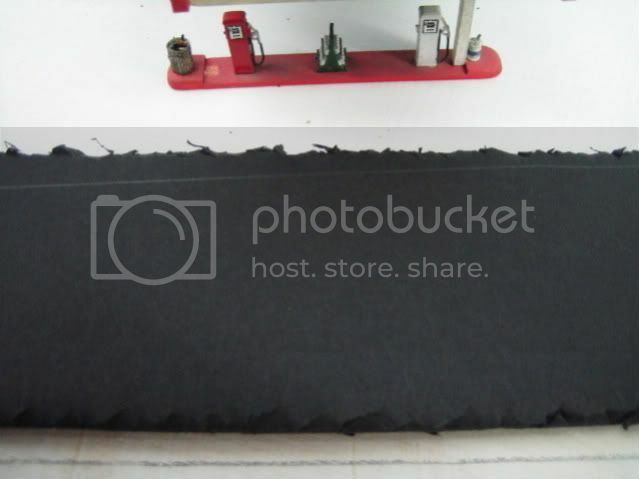 To make a tar and gravel road I started with black foam core left over from another project. I cut it to size with scissors which left a nice jagged edge instead of a clean one the way a knife cut would. Then I tore off the paper top exposing the black foam center. I brushed on white glue and then sprinkled on fine ballast. I made my road at the workbench. The mixture is 2 parts light gray, 1 part buff and 1 part gray. Using my fingers I lightly covered the foam surface. 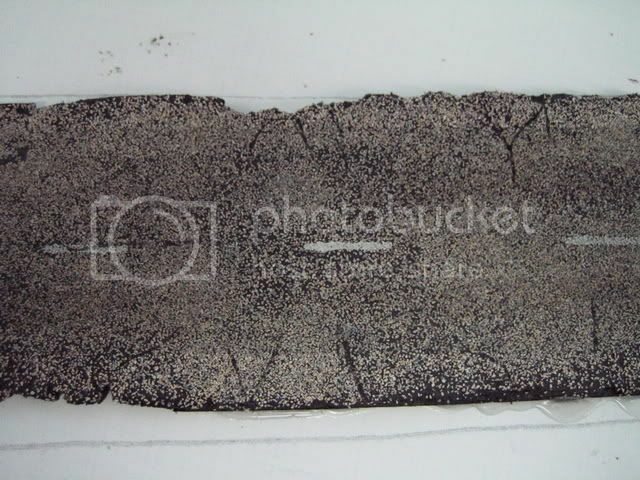 In fact, it looks realistic to have a little of the black (tar) show through in places. 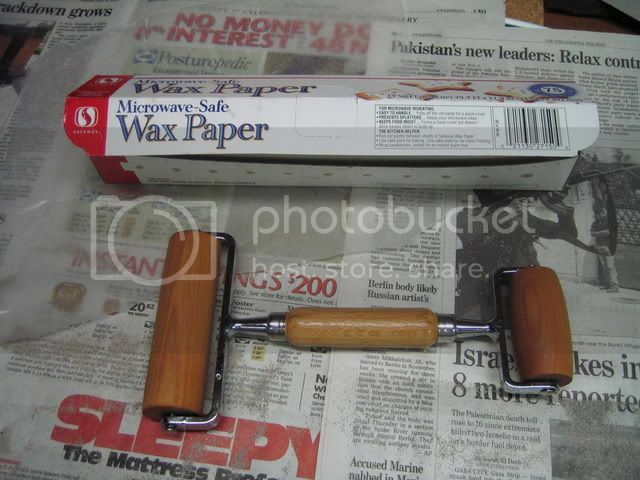 Let this set for 10 minutes or so and then use a sheet of wax paper and a roller of some kind (I used a pizza dough roller but you can use a rolling pin or a large dowel) to flatten down the surface. Since the foam is soft, some of the ballast will get embedded into it. My stripes are scale 5 feet long and 6 inches wide. The stripes are 10 feet apart. I don�t know if this is prototypical but it looks right. I used a fine point roller marker to add the black cracks. The final touch is to lightly brush on some India ink and alcohol to darken the travel lanes. 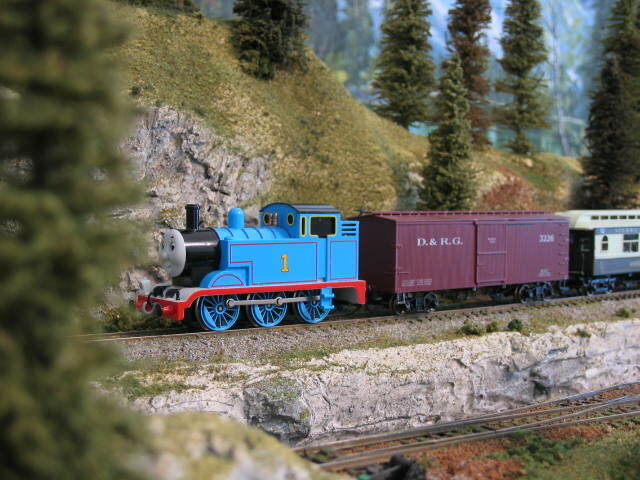 Note: since the ballast surface is very rough, don�t try weathering chalks. You can�t spread them. I hope you find some of this useful when making your next road. 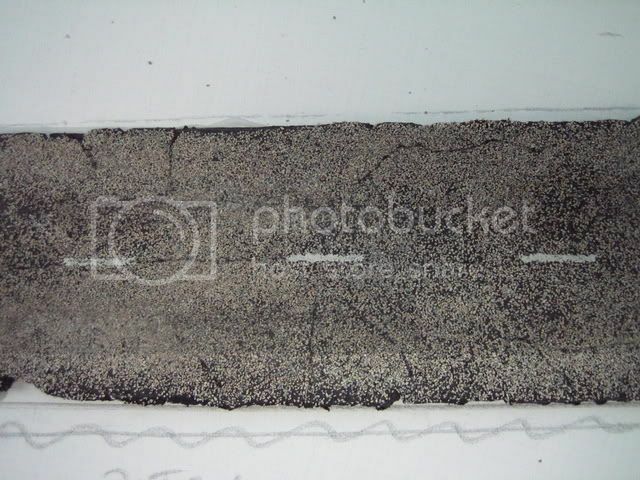 For an asphalt road you can used the black foam core without the paper, just leave off the ballast. It's very dark but you can lighten it with dullcoat, chalks or a light dusting of paint. Good luck! John thanks, this kind of information can always be used and placed in to a how-to folder. The following was posted in another thread. The information was a question about "How do you make your land forms". One great thing about reviving the opening morning lounge thread with a question is that any question that involves scenery can be linked here in this thread. Since this thread is a sticky it will be always on the first page while the good morning threads will disappear into the unknown. Here is a link to a discussion about modeling water. Mike C also included an excellent tutorial in his reply which I have taken the liberty of posting here. For the water in the wharf scene below, I spray painted the plywood base with inexpensive flat black paint before I installed the wharf. Because this was supposed to be a deep water area, I didn't use any other color, letting the black suggest depth. After the wharf was installed, I made a small dam at the edge of the layout with duct tape (the good stuff, not the cheap-o "duck" tape!) and poured Envirotex into the area. I was careful to follow mixing instructions and their suggestions for de-gassing the mix after it was poured. Then I let it dry for a couple of days. After it was thoroughly dry, I used a 1/4" wide flat brush with stiff bristles to swirl acrylic gloss medium. I made no attempt to get a regular or even pattern or to make the swirls of uniform thickness. Although the gloss medium goes on white, it clears to transparency when it dries. After it dried, I repeated the process, swirling a second layer over the first. The point of the two layers was to convey the impression of eddies and swirling water. For the quietly meandering shallow creek in the scene below, I again chose to use Envirotex. However, for the creek bed, I painted the base with a dark olive green (rather than flat black) to indicate water that might be 3'-4' deep. Then to create the impression of shallows, especially toward the shoreline, I feathered burnt sienna and raw sienna, letting the colors overlap slightly and thin out as they approached the shore and sand/gravel bars in the creek. As can be seen, I also added lots of pebbles and other 'debris' all along the shore and under the trestle. 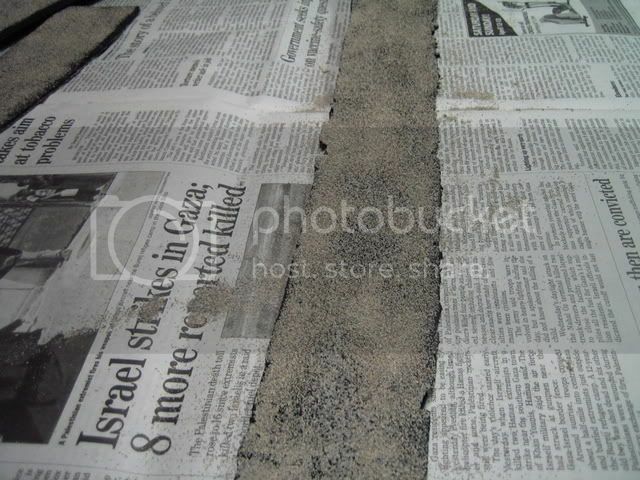 Once I was satisfied with the overall appearance, I poured the Envirotex for the creek. To convey the appearance of a wet, muddy shoreline, I painted it with Future floor polish. I think I wound up applying 3 coats of Future before I was satisfied. For the Foss' Landing diorama, I used a method for making my water that I first used many years ago. It's not complicated, but it is time consuming because of drying times. In a nutshell, after spraying the base with flat black paint, acrylic matte medium is stippled all across the water area with a stiff bristled brush. 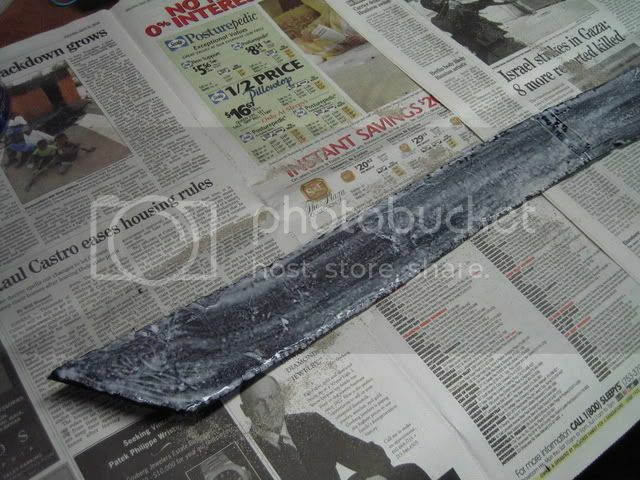 After that has dried, I brush acrylic gloss medium over all of it. Next, I drybrush and blend Polly Brown Drab, Olive Drab, and U.S. Brown Special. The object here is to create the impression of silt without making the water appear muddy, so I try to keep the colors as translucent as I can. Finally, and it's important to make sure the drybrushed paint has cured, Future floor polish to which I have added a couple drops of non-waterproof black ink is brushed on. To do the creek on my "Woodcutter's" diorama, I basically followed the techniques outlined above. The main difference is that I used Mod Podge, which is a form of acrylic gloss medium, for the water. After painting the bottom, feathering the colors, and putting in the sand/gravel bars and pebbly bottom, I swirled the Mod Podge in and around the bed until the entire creek was covered. A couple of layers was all it took. Well, this was kind of a long winded explanation. But if it helps someone or inspires someone to try something, then it was worth it. I'm impressed with how Mike avoided the creeping up effect that most poured MRR lakes and rivers have.. wonder if he could elaborate on how he came up with such sharp edges dividing the "water" from the shore. Do these look like real trees or model trees? Here are two threads where his techniques are explained in outstanding tutorials. Please post comments or questions in the threads below since they may not be seen if posted in this thread. 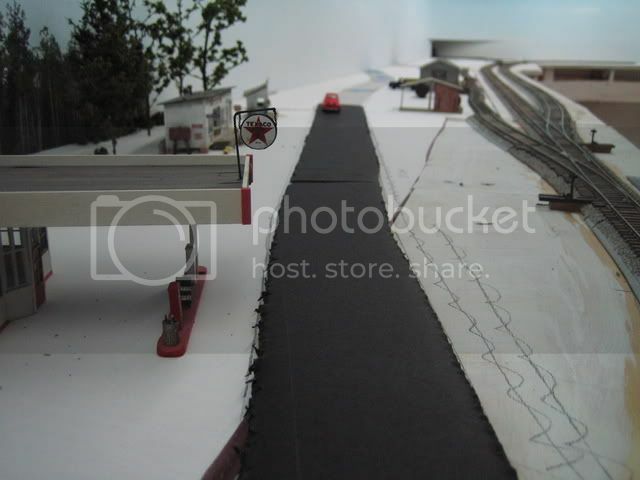 I really want to make a maintanence road next to my tracks on my ho module for my model railroad club. I started by painting the surface with a tan paint and i have some sand in which to make the road with. Does any one have any ideas about how to start? I really want to make the scenery POP. Not just have sand glued to foam. For starters read the description of how akimmons(Arnold Kimmons) made his tar and gravel road posted on this page near the top. 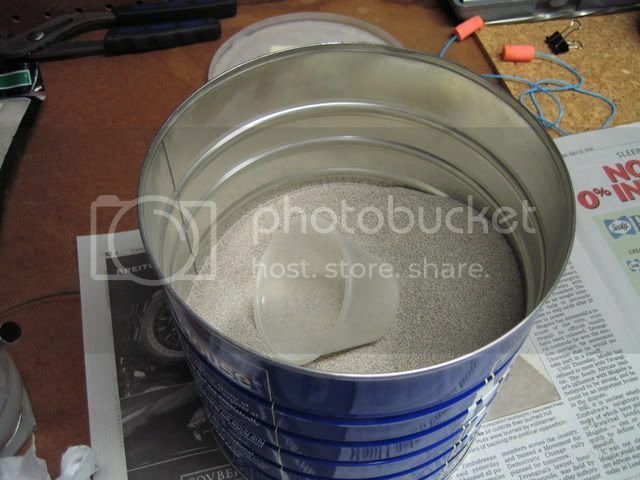 Just supplement sand for the tar and gravel. I would suggest that you have some color variation and I have used different colored tile grout mixed together to get a road that is not uniform in color and by adding sand and real dirt you can also vary the texture of the surface. I would also say if this is a maintenance road the road would not have defined edges or a uniform width since over time the sand would have washed to the sides. Also mother nature would have allowed weeds to grow along the edges and even into the road if traffic was light. Also if a maintenance road I would imagine trucks would have used the road and there would be ridges or ruts from the tires. These can be added just by rolling a truck back and forth along the road. You could add pot holes or washouts to show that the road gets little maintenance. Just some ideas but the best thing is to look at a real road of this type and model what you see. I live on a gravel road so I just go out and look at my road and then model what I see when making my gravel roads. 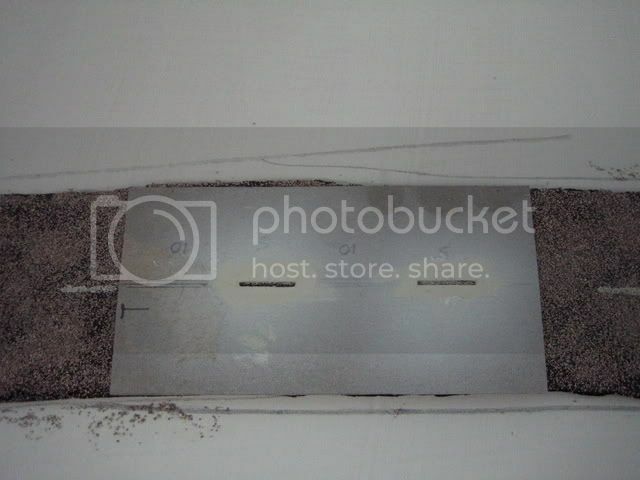 The link below shows "building" a simple Woodland Scenics culvert (2 pages ... 25 & 26). Ok here is my first How to video is not great but I hope it will help. It will be in two parts"How to make roads"
on RR-Line would help finish off your demonstration. Congratulations on your Atlas award. Originally posted by BbagsWell, this was kind of a long winded explanation. But if it helps someone or inspires someone to try something, then it was worth it. Score me as "well and truly inspired". I have a canal that I need to add 'water' to at some point, so your notes are very helpful. Yes , good stuff John, thanks.